Walt Disney on Faith, Church, Bible Study, Prayer & God. In these days of world tensions, when the faith of men is being tested as never before, I am personally thankful that my parents taught me at a very early age to have a strong personal belief and reliance in the power of prayer for Divine inspiration. My people were members of the Congregational Church in our home town of Marceline, Missouri. It was there where I was first taught the efficacy of religion … how it helps us immeasurably to meet the trial and stress of life and keeps us attuned to the Divine inspiration. Later in DeMolay, I learned to believe in the basic principle of the right of man to exercise his faith and thoughts as he chooses. In DeMolay, we believe in a supreme being, in the fellowship of man, and the sanctity of the home. DeMolay stands for all that is good for the family and for our country. Every person has his own ideas of the act of praying for God’s guidance, tolerance, and mercy to fulfill his duties and responsibilities. My own concept of prayer is not as a plea for special favors nor as a quick palliation for wrongs knowingly committed. A prayer, it seems to me, implies a promise as well as a request; at the highest level, prayer not only is a supplication for strength and guidance, but also becomes an affirmation of life and thus a reverent praise of God. Deeds rather than words express my concept of the part religion should play in everyday life. I have watched constantly that in our movie work the highest moral and spiritual standards are upheld, whether it deals with fable or with stories of living action. This religious concern for the form and content of our films goes back 40 years to the rugged financial period in Kansas City when I was struggling to establish a film company and produce animated fairy tales. Many times during those difficult years, even as we turned out Alice in Cartoonland and later in Hollywood the first Mickey Mouse, we were under pressure to sell out or debase the subject matter or go “commercial” in one way or another. But we stuck it out — my brother Roy and other loyal associates — until the success of Mickey Mouse and Silly Symphonies finally put us in the black. Similarly, when war came to the United States in 1941, we turned from profitable popular movie-making to military production for Uncle Sam. Ninety-four per cent of the Disney facilities in Hollywood became engaged in special government work, while the remainder was devoted to the creation of morale building comedy, short subjects. Both my study of Scripture and my career in entertaining children have taught me to cherish them. But I don’t believe in playing down to children, either in life or in motion pictures. I didn’t treat my own youngsters like fragile flowers, and I think no parent should. The American child is a highly intelligent human being — characteristically sensitive, humorous, open-minded, eager to learn, and has a strong sense of excitement, energy, and healthy curiosity about the world in which he lives. Lucky indeed is the grown-up who manages to carry these same characteristics into adult life. It usually makes for a happy and successful individual. In our full-length cartoon features, as well as in our live action productions, we have tried to convey in story and song those virtues that make both children and adults attractive. I have long felt that the way to keep children out of trouble is to keep them interested in things. Lecturing to children is no answer to delinquency. Preaching won’t keep youngsters out of trouble, but keeping their minds occupied will. Thus, whatever success I have had in bringing clean, informative entertainment to people of all ages, I attribute in great part to my Congregational upbringing and my lifelong habit of prayer. To me, today, at age sixty-one, all prayer, by the humble or highly placed, has one thing in common: supplication for strength and inspiration to carry on the best human impulses which should bind us together for a better world. Without such inspiration, we would rapidly deteriorate and finally perish. But in our troubled time, the right of men to think and worship as their conscience dictates is being sorely pressed. We can retain these privileges only by being constantly on guard and fighting off any encroachment on these precepts. To retreat from any of the principles handed down by our forefathers, who shed their blood for the ideals we still embrace, would be a complete victory for those who would destroy liberty and justice for the individual. Roland Gammon went on a search of famous people for content on his 1963 book about prayer. “FAITH IS A STAR” Walt Disney wrote the article above for this publication. Walt Disney held deep personal beliefs. Elias Disney (Walt’s Dad) was a deacon and named Walt after the family minister minister Walter Parr. 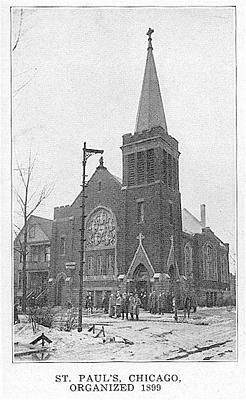 (St. Paul Congregational Church in Chicago) Walt’s brother Herbert had a daughter named Dorothy and she married a minister, Glenn Puder. It was at Walt’s request that the Reverend Puder delivered the invocation at Disneyland’s grand opening on July 17, 1955. Represented at the dedication were Catholic, Jewish and Protestant faiths.